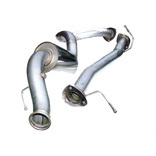 Stainless steel exhaust systems offer reliability, extended warranties as well as improved looks. Inc. VAT: £536.78 Inc. VAT: Info UK VAT charged at 20%. Ex VAT £447.32 Ex VAT Info Outside of EU and EU VAT registered companies only (not UK). Inc. VAT: £528.31 Inc. VAT: Info UK VAT charged at 20%. Ex VAT £440.26 Ex VAT Info Outside of EU and EU VAT registered companies only (not UK). Inc. VAT: £532.98 Inc. VAT: Info UK VAT charged at 20%. Ex VAT £444.15 Ex VAT Info Outside of EU and EU VAT registered companies only (not UK). Inc. VAT: £279.05 Inc. VAT: Info UK VAT charged at 20%. Ex VAT £232.54 Ex VAT Info Outside of EU and EU VAT registered companies only (not UK). Inc. VAT: £512.32 Inc. VAT: Info UK VAT charged at 20%. Ex VAT £426.93 Ex VAT Info Outside of EU and EU VAT registered companies only (not UK). Inc. VAT: £288.76 Inc. VAT: Info UK VAT charged at 20%. Ex VAT £240.63 Ex VAT Info Outside of EU and EU VAT registered companies only (not UK). Inc. VAT: £426.32 Inc. VAT: Info UK VAT charged at 20%. Ex VAT £355.27 Ex VAT Info Outside of EU and EU VAT registered companies only (not UK). Inc. VAT: £235.43 Inc. VAT: Info UK VAT charged at 20%. Ex VAT £196.19 Ex VAT Info Outside of EU and EU VAT registered companies only (not UK).